Rationalist Judaism: Was the "Charedi Day Of Rage" Charedi? 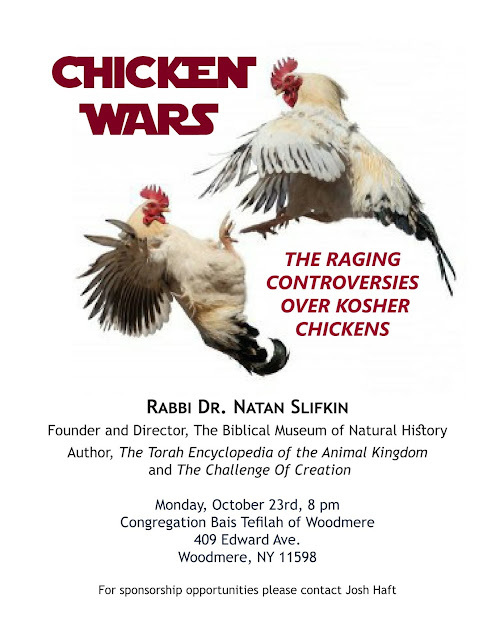 NOTE: My lecture this Tuesday in Teaneck on "Chicken Wars" is cancelled. But the lecture is taking place in Woodmere tomorrow (Monday), at Beis Tefilah at 8pm. Last Thursday saw the "Charedi Day Of Rage," in which thousands of charedi demonstrators blocked roads across Israel and engaged in mass protests, some of which turned violent. This was in response to the arrest of two yeshivah students who had not registered for an army exemption, and were caught after being pulled over for dangerous driving on their way back from the Dead Sea (no doubt visiting one of the many yeshivos there). It was organized by Rav Shmuel Auerbach's "Peleg Yerushalmi" faction. This was a very serious event. In the words of one participant, "We’ll fight with every fiber of our being; we’d accept death before transgression on this. We’ll fight to our last drop of blood. We will not give up. We’ll die before joining the army.” They will leave yeshiva and engage in violent warfare rather than leave yeshivah and serve in the Israel Defense Forces! (I saw it reported in the name of one cynical Rosh Yeshivah that halachically, they should not choose to die; instead, they should simply amputate their hands and be exempt from army duty.) On a serious note, though, this was a terrible enterprise, causing problems for countless thousands of people, as was the intention - the official summons to protest announced that וכל הגולה כולה תבער כמדורת אש. To what extent can this horrible event be called a "charedi" phenomenon? Rabbi Avraham Edelstein argues that it was not a charedi event at all. He states that the Peleg faction is only 5% of the charedi community, and does not represent the values of mainstream charedim. He concludes, "Don't call these people charedim. Don't even call them Orthodox." It is certainly true that there is a deep division in Israeli charedi society between the mainstream Rav Steinman camp and the Rav Shmuel Auerbach camp. I am also fairly certain that many, perhaps even most, Israeli charedim were disgusted by last Thursday's event. It is therefore misleading and even defamatory to consider it as representing mainstream charedi society. Still, to completely disavow any charedi aspect of the Day Of Rage is incorrect, for two reasons. First is that the Peleg group does not exist in a vacuum. As discussed previously in a post on Charedi Extremist Violence, there is a continuous spectrum in the charedi world of opposition to the State and the IDF. There was Rav Steinman and others referring to the government as Amalek. There was the entirety of charedi society turning out for a rally in which they recited Shefoch Chamascha - referring to the government. Yes, the Peleg faction is more extreme than the rest of charedi society, but they are clearly on the same spectrum. The second reason why it is incorrect to deny any charedi aspect to the Day Of Rage is that the rest of Charedi society is not condemning it (or even mentioning it). There is a report going around that Rav Chaim Kanievsky condemned it, but it's just not true; what he condemned was a protest against his emissary Rav Rosen at a yeshivah in Kiryat Sefer. Rabbi Edelstein is writing a kiruv piece for non-charedim. Have Yated or HaModia or Ami or Mishpacha condemned Rav Shmuel Auerbach (and have they even reported on the Day of Rage)? The mainstream charedi press has no qualms in calling out the excesses of Open Orthodoxy as demonstrating that they are not Orthodox. But they are not going to do the same here. Because, ultimately, they see Open Orthodoxy (and Modern Orthodoxy, and Religious Zionists) as "other," whereas they see Rav Shmuel Auerbach and the Peleg faction as "us." Let's be honest about what the societal problem is. That's the first step in trying to solve a conflict that's getting to be almost as severe as the Chicken Wars. Chareidi is as chareidi does. 1. Shefoch Chamoscha was not said about the government, rather about the elements that want to shut down yeshivos and stop the learning, Yair Lapid and co.
2. The Charedi establishment is the true target of these demonstrations. It is absurd to attribute responsibility for this to them. 3. There is a consistent line of public statements, at times of stress, demanding Charedi followers not use violence as a tactic. At the founding of degel hatorah, that was a major part of Rav Shach's speech, as well as at other, civil, protests. 4. The Charedi establishment has no interest in keeping the draft on the forefront of Israeli consciousness. For their purposes, quiet is the best. To accuse them of wanting, or having any benefit from, these violent actions, is ludicrous. Indeed, no mention at all. Apparently, this was so non-Haredi that it wasn't even news worthy. Your search - rage site:hamodia.com/category/israel-news/ - did not match any documents. I am not saying the mainstream Chareidi media has or hasn't address this protest. BUT.... the Anglo Chareidi media isn't its mainstream. For that matter, the Anglo Israeli Chareidi isn't a mainstream Chareidi person. It's something people like Jonathan Rosenblum need to remember more often -- what he sees in his circles can't be presented as trends in the Chareidi community. The baachur raised by a Lakewood alumnus is going to be far more liberal than one raised by a Ponovezh or Brisk alumnus. Second, your post remind me of attempts to condemn non-messianic Lubavitchers because when push came to shove, the circled their wagons with the messianists rather than feel loyalty to the bulk of Orthodoxy with whom their beliefs more closely mesh. However, social trends aren't driven by ideology. They are driven by ties of family and friendship ("they can't be so bad if Shimon is one of them"), shallow things like common label or uniform, or in Israel -- voting tendencies. The inability to condemn the Auerbach camp is not as much an indicator of common belief as an indicator of a social cause to excuse a divergence, and perhaps over time to minimize it. The bottom line is that now there is a significant difference in ideology; after all, it's not random that only one small camp participate and which camp it was. Last, I feel sad for the neshamah of haRav Shelomo Zalman Auerbach, who cannot be feeling all that much nachas at the moment. I saw condemnations in the Hebrew Yated- not that it helps much, but the Litvish Chareidi populace is dealing with this in two manners. Some are fire and brimstone cursing out every single "eitznik". Others are afraid to condemn RSA, having been brought up to never belittle a talmid chacham. Both groups would not consider a shiduch with an "eitznik" for their daughters. It is the talk of the chareidi town, yet there will be no counter hafganot and no loud condemnation. Why? Not for the reasons Mr. Slifkin likes to make up. Rather because the violence prone "eitznikim" want nothing more than loud opposition. It makes their adrenaline rush. Better ignore them. And demonstrations are not the chareidi way and never were. The extreme Yerushalmi factions are singular in this behaviour and RSA probably got it from them. "Second, your post remind me of attempts to condemn non-messianic Lubavitchers...they are driven by ties of family and friendship"
I've thought of this(and other comparisons) for some time. It seems that its always easier to criticize from outside the social group, and every group has its own "Shulchan Aruch" of considerations that outsiders don't have. Its critical to understand the shift in Charedi public relations, as it is all modeled on what they see in the United States. In the US, the left wing had no compunctions at unhappy Clinton voters rioting and tying up traffic after her election loss. The charedim see this, and, correctly or not, believe they can box in the Israeli left - who basically look to the US for their marching orders - by saying they're no different than the American left. In effect, they are throwing back, in the face of the left, the excuse they use for everything: "Dissent is the highest form of patriotism." This is also why the old excuse - "Torah protects" - has been quietly discarded. That hoary line has worn so threadbare that even the charedim themselves no longer believe it (if they ever did.) Instead, they speak in the tropes of social responsibility, as though it was a moral, liberal obligation for the community to support charedim. It is now being framed in terms of social justice, again, straight out of the US leftwing playbook. RN Eisenstein, one of their spokesmen, went on a much-listened to radio program here recently and spoke in exactly those terms. It is indeed hypocritical for American liberal Jews to "tolerate" violence and demonstrations at home, and yet condemn it abroad. The charedim are counting on that point to stifle criticism. The only problem is that the left has never had difficulty with other forms of hypocrisy, so I don't see why this would bother them now. In any event, rainbow is basically the new black, so keep your eyes out for similar trends in the future. 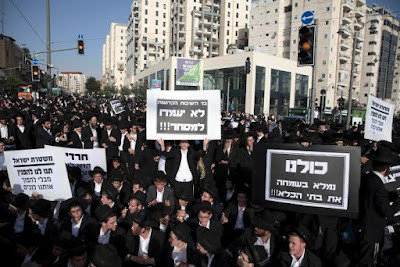 You must have missed the charedi radio - they were livid and vehemently opposed the "day of rage"
R noson you are wrong a letter came out signed by many roshei yeshiva against them ,the letter reads is as follows:"הננו בזאת בפנייה נרגשת לרבבות עמלי התורה ובניה השוקדים על תלמודם בהיכלי הישיבות הקדושות ובכוללי האברכים, לחזור על הדברים הפשוטים בדרך התורה שמסורה בידינו, כי מחובת כל בני התורה יראי השם וחושבי שמו לחזק את יקרת ערך התורה הקדושה ולהוסיף חיזוק בשקידת הלימוד בהיכלי התורה מתוך יראת שמיים טהורה העומדת לעד וכן לשמור בכל משמר שלא להיגרר בשום דרך שהיא אחר מעשים שאינם מדרך התורה, ש"עוזבים מקור מים חיים" וגורמים לחילול שם שמיים בפרהסיה בהשפלת כבוד לומדי התורה וחכמיה. i guess you will see this letter in the next few days. The objections would be no less vehement were the break-off have been to the more liberal side of the spectrum (Open Haredi?). Nor is the mainstream objection due to sympathy with how the demonstrations affect non-haredim. This is why Rav Chaim spoke of a Zaken Mamre and why his objections today were due to a yeshiva having been invaded. Note that Talmid's letter from the roshei yeshiva is entirely focused on the Chillul HASHEM of how Bnei Torah will be perceived and that the protestors should rather be in the Beis hamidrash. In other words, its focus is on how it affects lomdei Torah, not on how it affects everyone else. Your analysis is wrong on 2 points : first of all they write וכן לשמור בכל משמר שלא להיגרר בשום דרך שהיא אחר מעשים שאינם מדרך התורה, which means in other words that it is wrong to do it (this is a regular phrase rabbonim use to denounce something), secondly chilul hashem is the most evil thing a person can do in this world (as we are essentially here on this world for kvod shamayim) and therefore has no kapara in this world. on a side note the charred MPs are also preparing a letter to denounce these demo's. Nothing in the letter demonstrates any feelings or sympathy for those who have been inconvenienced or damaged (property destroyed, earnings lost, opportunities lost, time lost, spat upon, verbally abused, etc). The only thing they are explicit about, and seemingly care about, is how it affects so-called "Bnei Torah." As for Chillul HASHEM, yes, that's a terrible thing. How would you feel, however, if it were YOU who were being spat upon, cursed, had your property damaged, were late for work or for an simcha or for an appointment, and the ONLY thing being denounced is the PERCEPTION (Chillul HASHEM, that reflects poorly on those who dress similarly to the perpetrators)? They share the same education. So if Harav Steinman will call all the haredi to protest, we will see the same not moral behavior. Give me a break. That was not a condemnation of the Peleg behavior. That was a condemnation of a specific event in Kiryat Sefer.